In rifling around in the refrigerator last week, taking stock of what we needed for the weekly stock-up, I realized I had a bag of fresh cranberries lurking in the veggie bin. I knew I was done with cranberry sauce for the year. And, I wasn’t in the mood for fruity drinks. I had seen several versions of these delightful cranberry bars on several blogs, so I decided to make those with my turned up treasures. Tracey’s version was the one that finally sold me. Shortbread made with brown butter? Be still my heart. They were so delicious! A nice tartness from the cranberry, with the juice from the orange rounding out the sweetness. They held together really nicely too, which is something that I’ve had trouble with fruit/shortbread bars in the past. I sent the leftovers into work with Jon today, and everyone really enjoyed them. He said they went quickly! 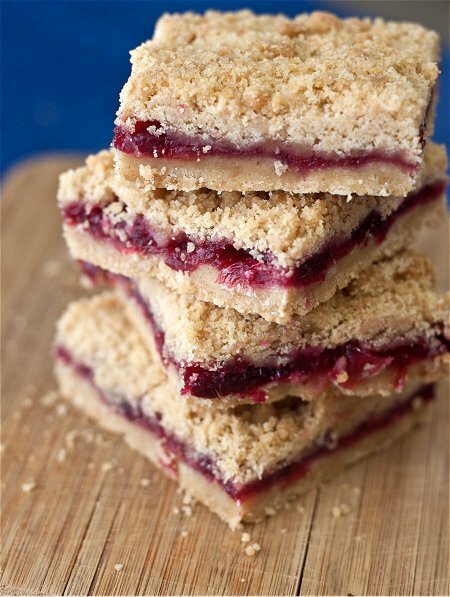 If you have a bag of cranberries leftover from the holidays hanging around, make these. If you don’t, pick up a bag before they’re gone for the season. I plan to do just that this weekend, and freeze a couple of bags. It’s nice to have a stash to make cranberry lemonade in July! Enjoy. While the crust bakes, make the streusel by combining the remaining 1/4 cup of sugar with the reserved dough. Use your fingers to mix until crumbly. Also use this time to make the cranberry filling. Combine the cranberries, sugar, orange zest and orange juice in a medium saucepan, and bring to a boil over high heat. Reduce the heat to medium-high, and continue boiling until the mixture is thick and syrupy (most of the cranberries will have popped), about 5-8 minutes. Turn off the heat, and let cool for 5-10 minutes. I have a few packs of cranberries in the freezer. Was looking for a “non-Christmasy” recipe to use them up and I think I’ve found it! Absolutely love the way these look. Ohhh , I love the fact that they are made with browned butter! Browned butter makes everything better! These look really good! I agree… the shortbread and brown butter combination sounds delicious. These sound incredible, and I have cranberries looking for a home! Pinned this…thanks for sharing!